Although in Bengal the nine days of Durga Puja is very special, but these five days of Panchami to Dashami, is made to see what is in the air. In Bengal's small districts, Bengalis celebrate every day of worship in different colors. Even if they do not have the power, they enjoy this pooja from the house colors. Mother's worship begins after the mother's pavilion takes place. Every day of Navaratri has an importance. The mother is prepared from the first day to the fifth. The worship begins after the festival. Today we will tell you about the special importance of these five days for the Bengali people. Sashthi is also called Mahashashti. On this day Bengali is seen in a different style. 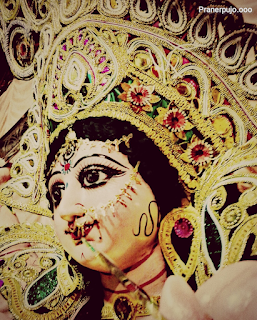 If we remember the stories of the Puranas, Goddess Durga comes to this earth on this day. He is welcomed with Dhak Dhoom. 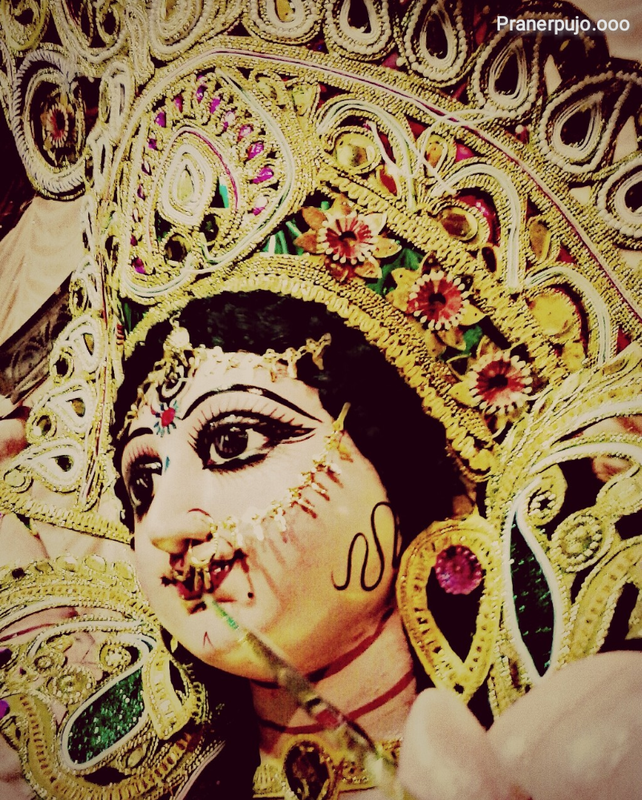 On this day the face of Goddess Durga is opened. So far, their face is kept covered. They are welcomed with an insight, invitation, and the worship of the mother starts with Uli sound. Some of the Pandels gets the final finish of beautifying. In this Day many of the people started to visiting the Pandels to see the special Theme of the Pandels with their friends. On this day, cola dwarf is decorated with a yellow silk sari. Firstly he is worshiped. Pandit Mashai worshiped the first Kola Buddhist and after that the worship of the mother is Dhok Dhol. Lord Ganesha is also established on this day. The Kola Bou is called the epitome of auspicious message. On this day nine kinds of plants are worshiped, they are bathed,in the nearest pond in the morning with Dhak & Dhol, it is called Mahasanan. 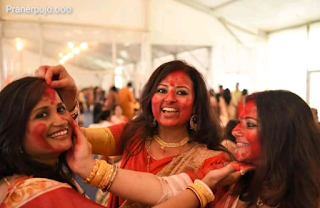 Saptami is special for young women. They wear a beautiful yellow sari and go to the mother's pavilion and pray for the blessing of the mind. In the night everyone enjoys with their friends by visiting other Pandels, eating some special foods etc. Ashtami is special, because on this day buffalo is sacrificed. Those who give Anjali on Ashtami's day, they have to go to the pavilion in the morning and give floral wreaths. Women wear a red saddle sari and delight the mother. Married women pray for a long life of their husband by placing a long vermillion in the branch in hand and in demand. Actually, today is celebrated as the burning of Mahishasur. The victory of good over evil is celebrated. There is a practice of sacrifice in some villages today, but more people worship with mother's flowers and fruits. Pandit chants mantras in Sanskrit and families go to Pandal for worship. Many people open their fast today and worship the Kumari and make a complete pudding and enjoy them. 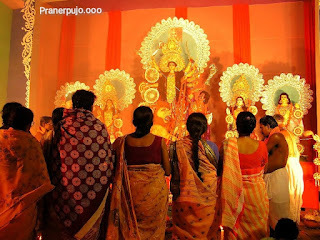 In the evening all the people with friends make a long queue to see Pandal. The next three days are very interesting for the Bengali people. They roam the pandals and enjoy the worship of the whole night. This Day is also known for Khaan or Sandhi Puja. Sandhi Puja is happens in a Particular Time, it's the longest worship or Puja by Pandit Mashai, which has a various time time in Every Year. 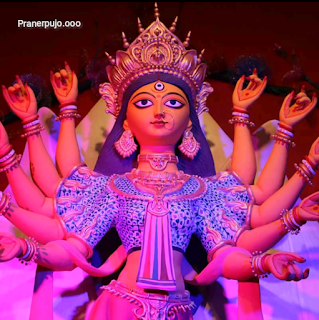 In the same time Durga Maa is Worshipped by pandit, Every Women do pray for her family and every boys make a great sound by Fireworks. If you are afraid the fireworks then you hardly tolerate the sound of fireworks because Everybody makes a competition of fireworks..so the sound of fireworks is so Heavy. Dhak & Dhol also plays with them which makes the sound more heavy.. However it's Really a Special Day for Bangali. Navami the ninth day. 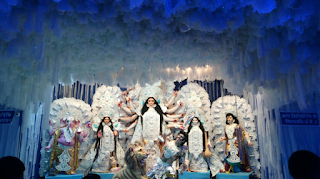 Not for Bengali's, but in every corner of the country everybody in every city celebrates Navami with great fanfare. The day of Navami is most special. This is the beginning of the day after the occasion of worship. For MahArati people go to the pavilion and worship the mother. On this day many people go to Dandiya in the evening, then some people enjoy music by dancing and enjoying the day. The children are in the club with the hymns of the mother and with Bengali folk songs. Mother blesses me with great emotions. On this day, girls come out with great clothes to go to Pandals. 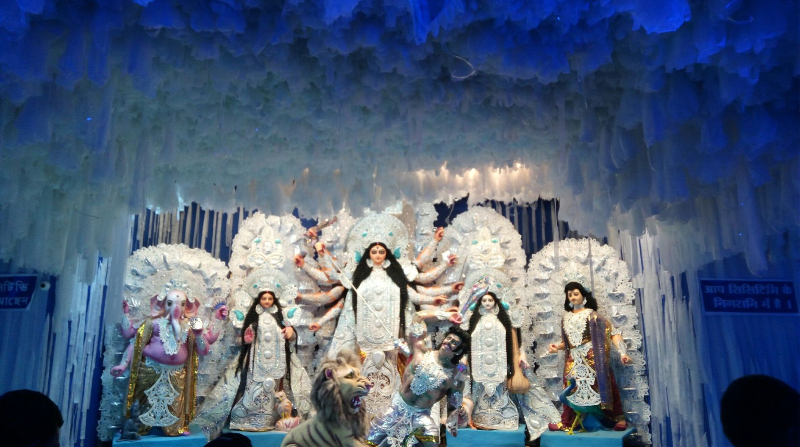 Boys proposed girls and the Boyfriend & Girlfriend Visit the Pandel of Durga Puja, they want to visit every Pandels and make some memories. People are clicking selfies to remember that moment in later. So overall it's a Day of Love and Couples are enjoying heavily. Dashami is the end of worshipping or Puja. On one side, where the eyes of the devotees of the mother remain dry, on the other hand Vijaya Dashami is happy in the homes. A lot of sweets are made, people go to their senior men's house and take their blessings and play the vermillion in the evening and farewell to the mother. Suhaagan(married ladies) and the other play with vermilion like the Holi with each other and the mother is also decorated like a bride. 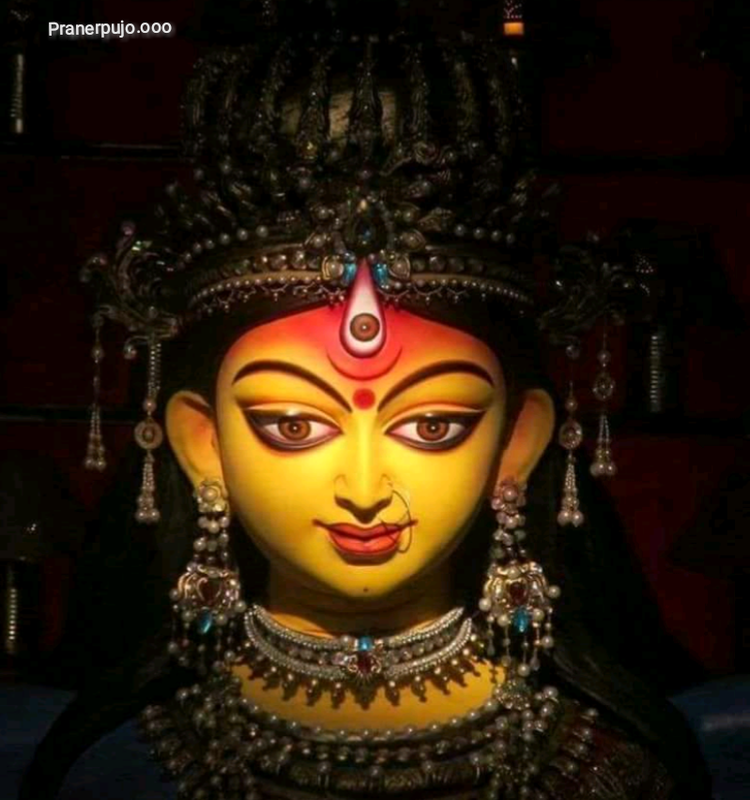 Jai maa durga ki, jakhhe kothai, river river Dhara asab kobe bachar beyond With this slogan everyone says goodbye to mother. By immersing the mother in water and everyone waits for the Next Year. *Many People are also celebrate two-three days more and then they are immersing Durga mother statue in the water.